Asked tricky questions about recommendations for a 12-year-old nephew (unnamed). Fortunately, "books for 12 year old boys"would be my chosen specialist subject if I ever appeared on mastermind - ha ha! 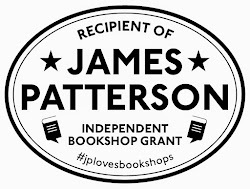 Appeared slightly stunned once I'd loaded her with books, explained the loyalty card, gave her the current issue of the newsletter. Nevertheless, she clung determinedly to initial purchase selection, and simply said she'd have to "ask about which book her nephew might want". When engaged in casual conversation during sales transaction about where she was from, said she was just "passing through Abingdon" on "business". Well I would suggest that you stop worrying about how good you look and start putting your energy into sabotaging the competition. Why don't you send some artfully damning letters of complaint about the horrible treatment you received in each of your competitors' stores? You could handwrite these, in crotchedly scribbly lettering, and post them from villages around the country so as to throw the committee off the scent. I couldn't possibly do that...it's not very British! 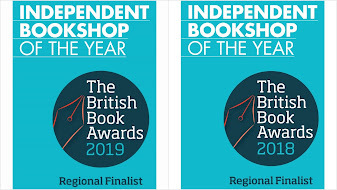 And besides, if the other bookshops have worked as hard as we have to get on the shortlist, they deserve their places and we wish them the best of luck! Not very British?? Hey, I've read SHAKESPEARE!